On Friday 20th March 2015, we notified existing NEM-Watch clients that an early release of NEM-Watch version 10 was available to them. This early release (v10.0.4) was linked on the downloads page of this new portal. There’s still more we are planning to introduce into the v10 upgrade later this year, when we return to this project. Because we have to move onto other priorities at present, and especially because this provides more time for us to seek initial feedback from those that use this early release, we are making this version available at this point in time. Coincident with the upgrade to NEM-Watch v10, we’ve redeveloped this NEM-Watch portal to provide a clearer focus on the four areas in which NEM-Watch has been targeted to deliver you value. In particular, we’d like to highlight these tips for use, which have been compiled based on our experience in working with hundreds (thousands?) of NEM-Watchers over more than 15 years – and so learning what helps clients to gain the most value from their existing licences. (b) Email us with your thoughts. Since it was first introduced in 2000, NEM-Watch has always been focused at delivering situational awareness to a broad cross-section of electricity sector participants, spectators, and commentators. Since 2000, the National Electricity Market has undergone ongoing evolution. As such, we’ve continued to enhance NEM-Watch over the years to ensure that it keeps pace with the ongoing changes in the market. 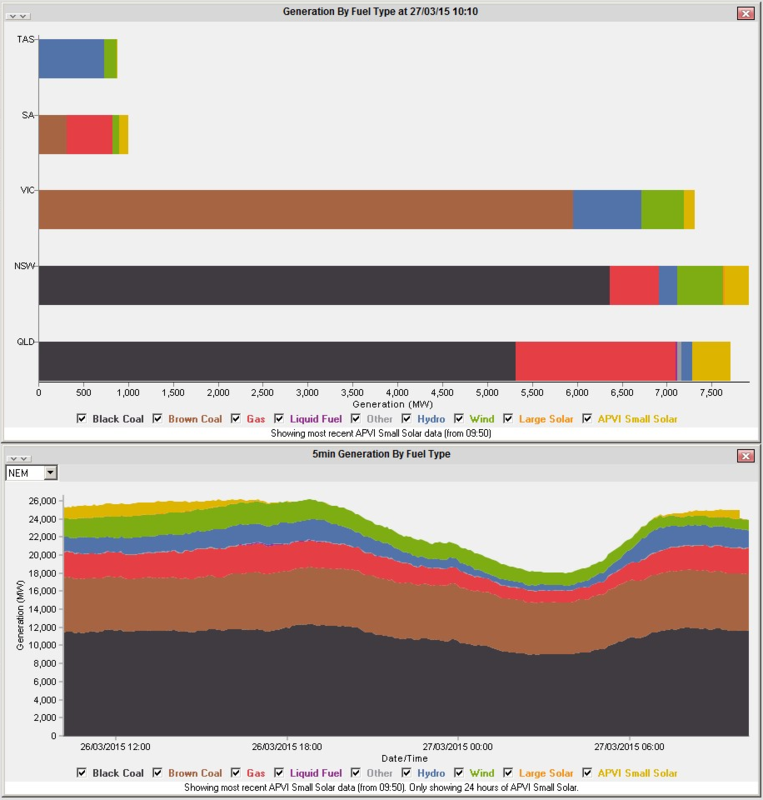 With the upgrade to version 9, we introduced a view of generation by fuel type (amongst other new views). This incorporated the AEMO data that was published at that time. (b) We have also collaborated with the Australian PV Institute (APVI) to package their estimates of small-scale PV production, aggregated to a regional level. This new data is presented is presented in two different charts, as shown below – the top one being a single instance in time and the bottom being a trend over time for the geographical area selected. Astute observers will also have seen the top chart appear elsewhere on the internet as well! This (which we have done in parallel) is an additional approach we’re adopting to further assist in making the complexity in the NEM more understandable, to a broad range of people. Though not as obvious (nor perhaps as topical) as the addition of solar PV into NEM-Watch, we have also made a number of other enhancements with this early release of v10 designed to assist you in maintaining a clear view of what’s happening in the NEM – both the short, sharp, shocks and also the creeping changes. Since 2000 we’ve seen that NEM-Watch has also been widely used to assist in communications – both internally, and externally. Inclusion of market snapshots in reports, presentations and the like – along with foyer and conference room displays – have been some of the methods we’ve used. It was in version 8 that we introduced the ability to email some market context, directly from within NEM-Watch itself (and to include “email with snapshot” as an action with NEM-Watch alarms that are set). With version 10, we’ve ensured that the file name used is more intelligible (identifying the dispatch interval highlighted), to enable you to utilise your electronic library of market events more efficiently. New to version 10, we have augmented this capability with the ability to also Tweet from directly within NEM-Watch itself, to save you time if you observe interesting market events occurring at a particular point in time. How to do this is explained here. In parallel with this development, we also established this NEM-watch-specific Twitter account, through which we intend (over time) to provide more context to what’s happening in the world of NEM-Watch. To deliver the new data sets noted above, we reconfigured the data delivery mechanisms used by your copies of NEM-Watch to independently access data from the cloud. We run dual redundant data delivery mechanisms in different physical locations, utilising different service providers to reduce the risk of you seeing hiccups in your data flow. What your IT Administrator might want to refer to are the updated System Requirements here. Note that this data feed is still reliant on the AEMO’s “nemweb” public access data source. This tends to be pretty good, but occasionally does go down (when this happens we’ll try to message our NEM-Watch clients, through a scrolling message on NEM-Watch at the time, to let you know of the cause). (b) Email us with your details. Similarly, working on the v10 upgrade has given us the opportunity to also update the way in which the application works to align it more closely with the newer windows operating systems. In more recent times our clients in different parts of the world have encountered issues in running NEM-Watch due to different types of regional settings. Those issues which we have been made aware of have been rectified in this upgrade. There’s a number of other miscellaneous bug fixes and tweaks which we have completed that don’t fit into the categories above.